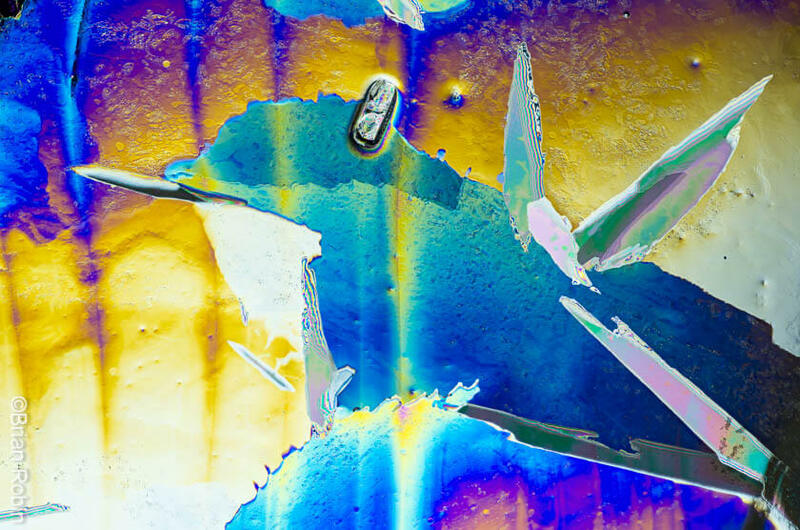 To combat this colour shortage, I seek out richly saturated photographic subjects – blobs of paint, yummy peanut M&M’s, crayons, paint chips, or ice. 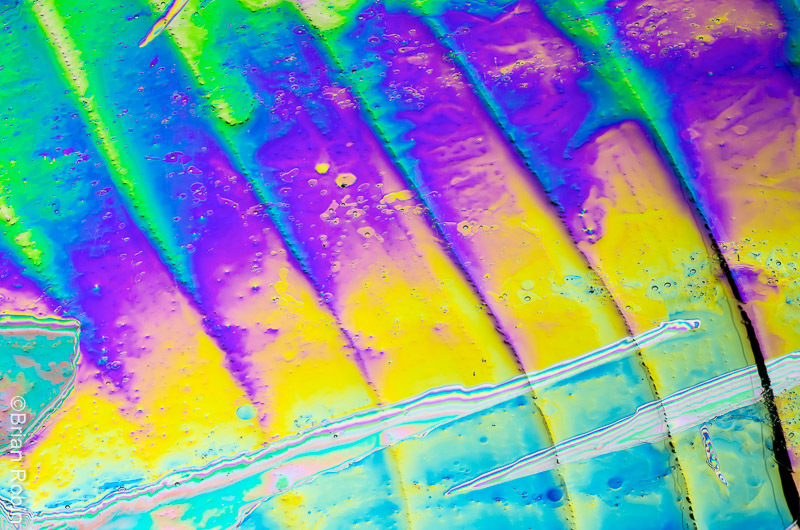 A birefringent material does spooky things to polarized light. Specifically, I’m looking for thin ice, the kind you find on the edges of slow moving rivers, or streams, or on top of puddles after a cold evening. The kind of literal thin ice you want to avoid skating on (that figurative thin ice can evoke colourful language, but that’s another topic…). 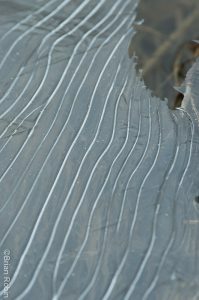 It’s typically pretty colourless, it can form in patterns that are interesting on their own, but the fact that it’s thin and ice means there’s a hidden world of colour waiting to happen. 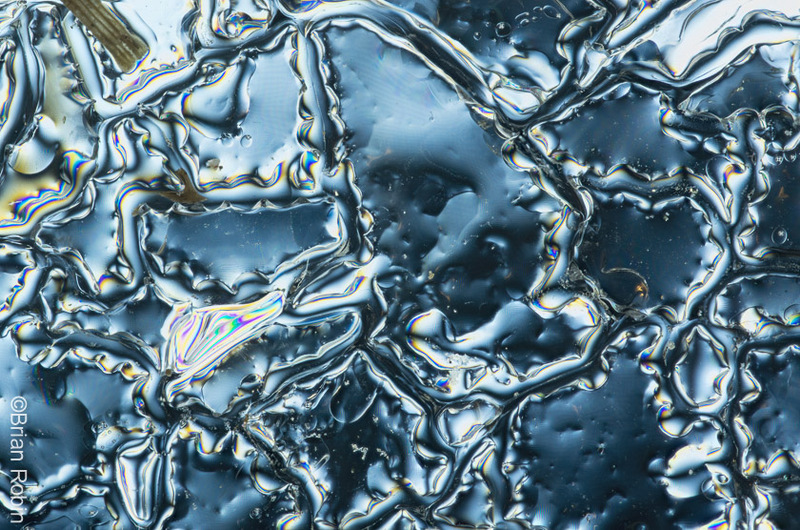 Ice is a birefringent material. 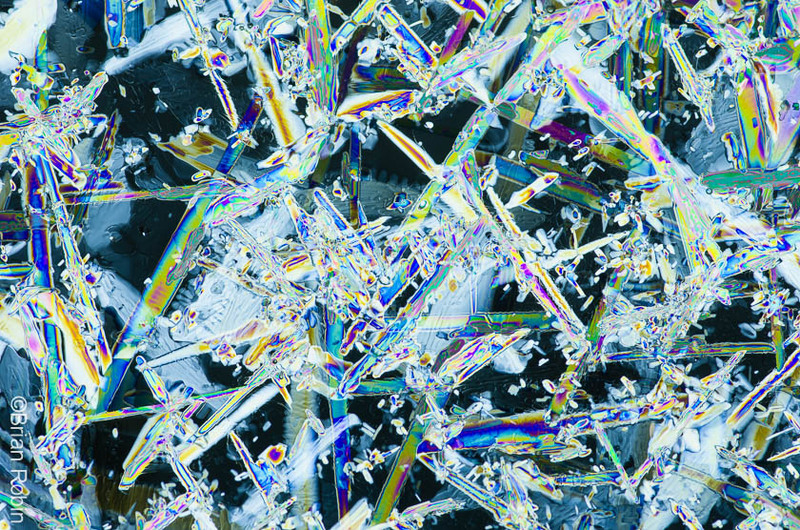 Birefringence is a big, sciencey word that essentially means “ice does spooky things to polarized light”. A thin piece of ice, e.g. taken from the edge of a river (don’t fall in). 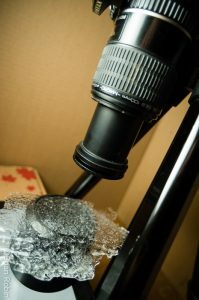 A polarized light source behind the ice, e.g. a tablet or lcd monitor. A polarizer filter on your camera. My basic setup is shown on the left, you can click it for a larger version. The tablet is showing a blank, white page. My piece of ice is raised off the tablet by a lens hood – this keeps the pixels of the screen from being in focus, keeps the ice away from the heat generated by the tablet and lets the ice be backlit by the tablet. My camera is armed with a macro lens so I can focus nice and close, and there’s a polarizing filter on the lens. A tripod is recommended, exposures are often in the 1/2 second or longer range. It’s also best to work in a cold room, it’s ice and ice melts! 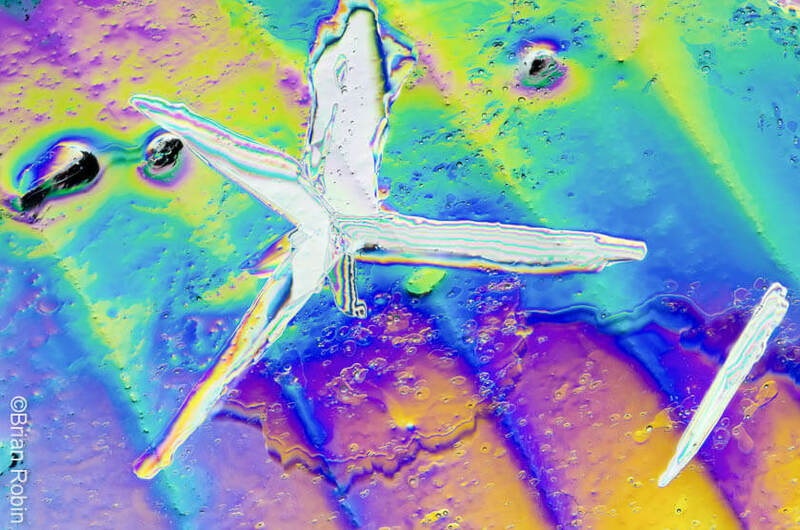 Pretty trippy for a slab of frozen water! 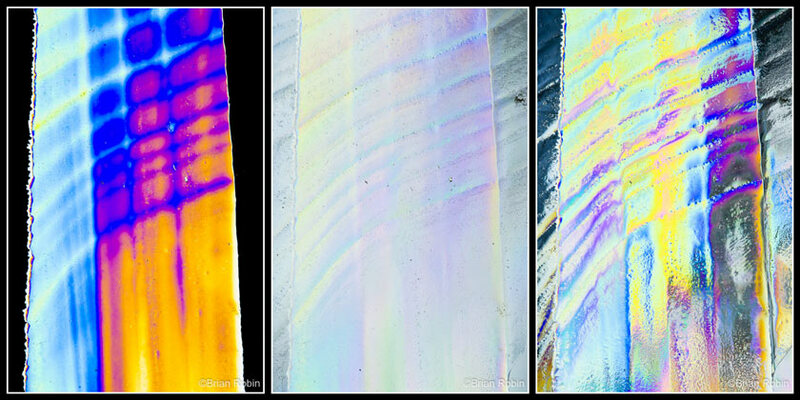 Nothing was changed between these three images except the polarizer on the camera was rotated. Endless winter fun for the easily amused. As you can imagine, this is endless fun during a cold Ontario winter. Find a piece of ice. Put it in my little polarized setup. Move stuff around until I find something interesting. Start snapping. Never ending joy from a wee chunk of frozen water! The camera was shooting straight down on this piece, a few pockets of colour, but mostly a silvery sheen (that’s neat too!). Note the bit of grass frozen in the top left. See the same bit of grass on the left for a location reference – this is nearly the same section as above, but now the camera is shooting at about a 45 degree angle. Also notice the grid like texture in the colours, this piece was very close to my LCD screen, and some of the screens pixels are in focus. 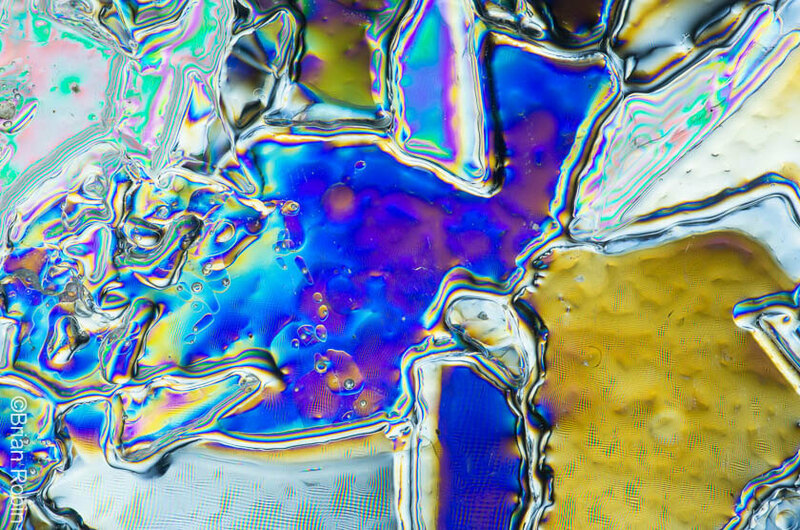 Birefringent ice images are largely abstract, but there are often hidden little scenes to be found. Birds, camels, people, or even entire mountain ranges. Perhaps the product of a cold-addled mind, but who knows? Who cares! Any endeavor that keeps you (reasonably) sane while staring at 5 foot snow drifts out your window is worthwhile! There’s no wrong or right. I said to keep it cold, but let it partially melt, tiny bubbles in things can be exciting. Put the ice close to the lcd for a bit of texture. Try rotating the polarizers. Try thicker pieces of ice. Try making your own ice (that will be another post!). 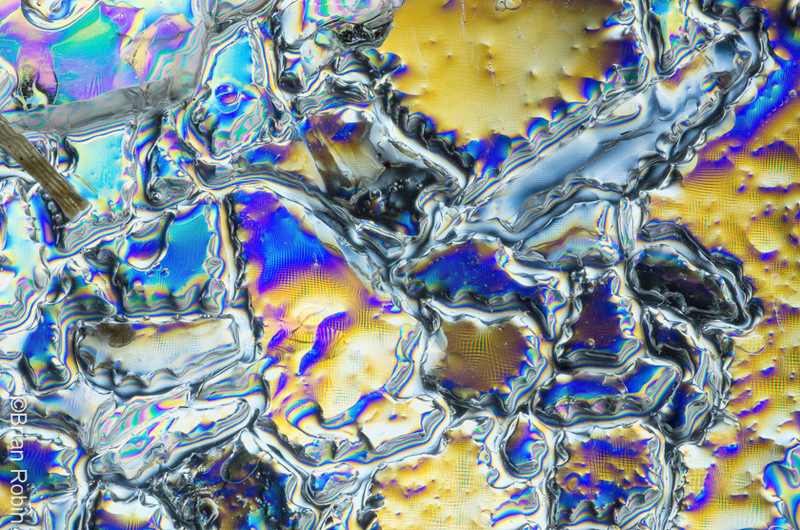 Try other birefringent materials – clear plastics are a good place to start, readily available and less melty. Most importantly, have fun making your own images or just enjoy looking at mine!